In this paper, performance analysis of wireless communication over α−η−μ fading channels has been investigated. First, analysis has been carried out for the case when communication is subjected to the influence of co-channel interference. 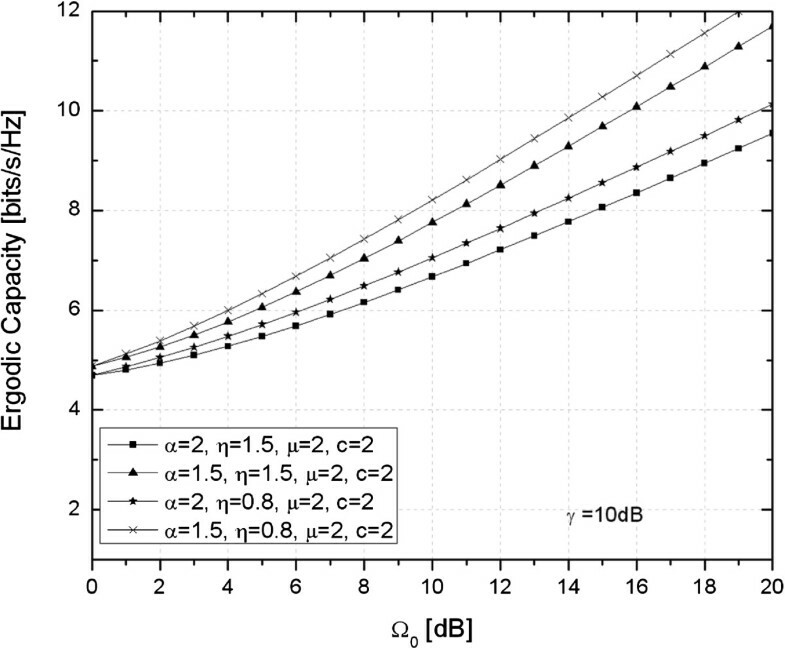 Closed-form expressions have been derived for the probability density function and cumulative distribution function of the received signal-to-interference ratio. Outage probability has been obtained for this case, in the function of various values of system parameters, and also for the case when selection diversity has been presented at the reception. Further, simultaneous multipath fading and shadowing occurrence has been analyzed, through deriving novel composite Gamma long-time faded α−η−μ fading distribution. First-order statistical parameters have been obtained in closed form, for this novel composite distribution, and capitalizing on them, standard performance measures have been efficiently evaluated, graphically presented and discussed in the function of system parameters. Every wireless communication system design must take into account three major channel propagation impairments: short-term fading (multipath propagation), long-term fading (shadowing) and the corruptive effect of co-channel interference . 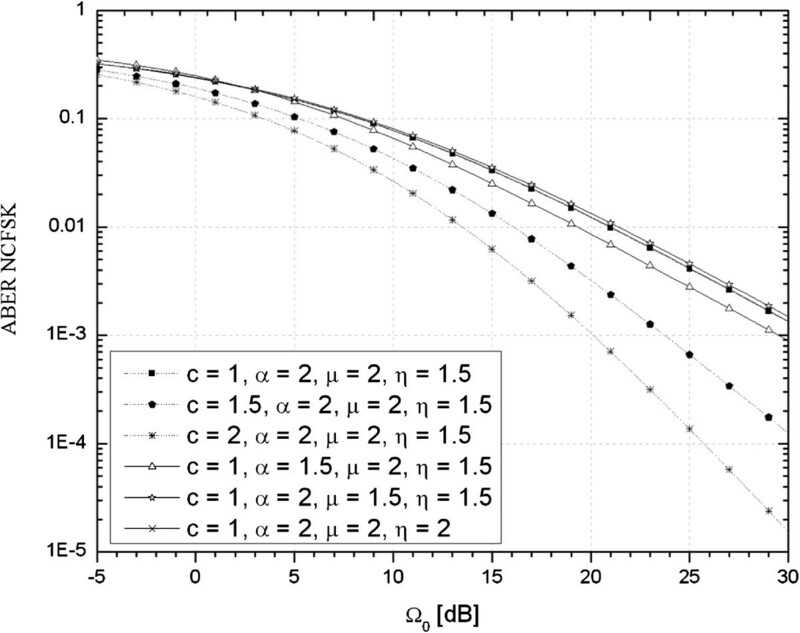 The non-linear properties of propagation medium have been considered extensive recently [2, 3]. Various short-term fading distributions like Nakagami-m, Ricean and Rayleigh assume a resultant homogenous diffuse scattering field, from randomly distributed scatters. However, surfaces are often spatially correlated and they characterize non-linear environment. Exploring the fact that the resulting envelope would be a non-linear function of the sum of multipath components, novel general α−η−μ distribution for short-term fading model was recently presented. Probability density function (PDF) is presented in the form of three parameters α, η and μ, which are related to the non-linearity of the environment, the number of multipath clusters in the environment and the scattered wave power ratio between the in-phase and quadrature components of each cluster of multipath, respectively . 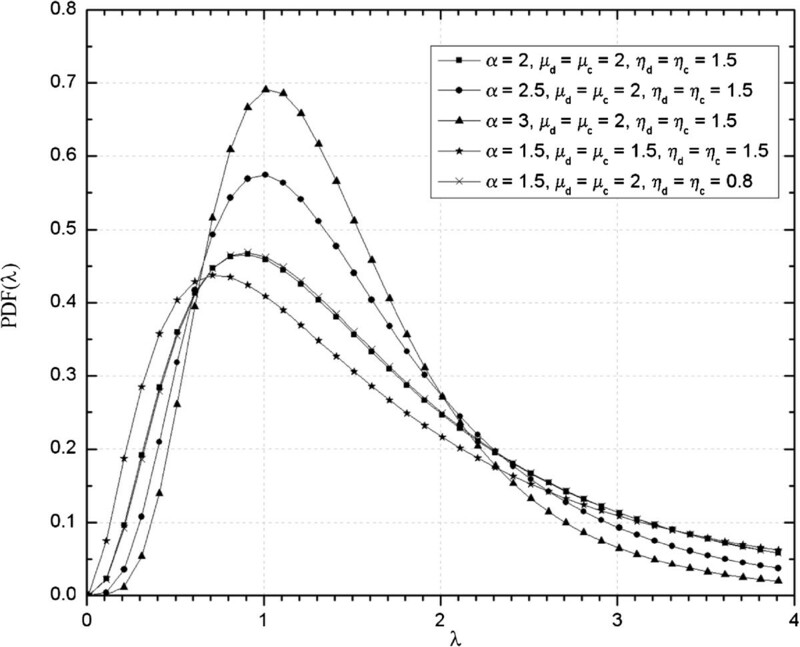 Since it is a general fading distribution, the α−η−μ model includes as special cases other short-term fading distributions, like Rayleigh, Nakagami-q (Hoyt), Nakagami-m, η−μ, Weibull and one-side Gaussian distribution. By setting parameter α to value α=2, it reduces to η−μ distribution. Further, from the η−μ fading distribution, the Nakagami-m model could be obtained in two cases: first, for η→1, with parameter m being expressed as m=μ/2 and second, for η→0, with parameter m being expressed as m=μ. It is well-known that η−μ distribution reduces to the Hoyt distribution, for the case when μ=1, with parameter b defined as b=(1−η)/(1+η). By equating the in-phase and quadrature component variances, namely by setting η=1, the Rayleigh distribution is derived from Hoyt. Also the Weibull distribution could be obtained as a special case of the α−η−μ model by setting corresponding values to the parameters η=1 and μ=1. Major contribution of this analysis is then the above-mentioned generality. Here, analytical framework for performance analysis of wireless communication system subjected to co-channel interference (CCI) over α−η−μ fading channels will be presented. Signal-to-interference (SIR)-based analysis will be provided and closed-form expressions will be provided for received SIR PDF and cumulative distribution function (CDF). From this statistics, outage probability (OP) values will be obtained in the function of system parameters. Even OP improvement will be observed through a prism of space diversity reception techniques appliance, particularly selection combining (SC) reception. Number of composite channel models have been used in literature for the wireless communication systems analysis, for the case when multipath fading and shadowing occur simultaneously. 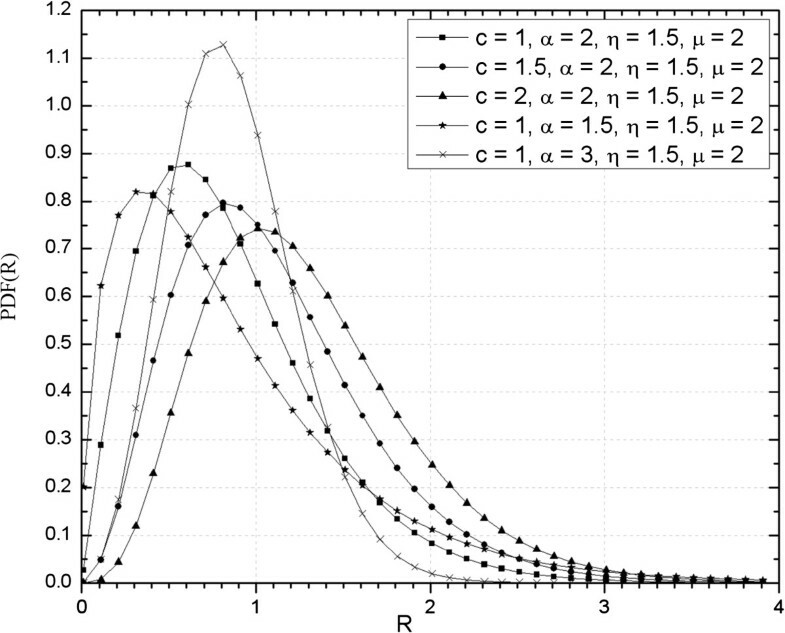 Such are the η−μ/gamma , the κ−μ/gamma , the K, and the generalized- K (KG)  distribution models. Similar work has been presented in [8, 9]. Non-linear, non-homogenous, shadowed propagation have been analyzed in , but for the case when dominant, line-of-sight (LOS) component is taken into account. Starting from general α−η−μ distribution, closed-form statistics (PDF, CDF and n-th order moments expressions) will be introduced, for novel composite distribution. That is another contribution of this work since this composite distribution has not been reported in literature so far. Obtained mathematical form will allow simple performance analysis of wireless communication systems, operating in composite fading environments. This performance analysis is also accompanied by graphically presented numerical results, which show the influence of various communication system parameters (fading and shadowing parameters), on the standard performance criterions. In modern wireless communication systems, a tendency to preserve the available spectrum is present. Preserving of available spectrum could be obtained by reusing allocated frequency channels in areas, which are as geographically close to each other as possible. However, distance for reusing channels is limited by the level of CCI. CCI is defined as the interfering signal that has the same carrier frequency as the desired information signal, namely two or more channel signals from different locations, but operating at the same carrier frequency, due to frequency reuse interfere. In this section, we will analyze how CCI as a general distortion affects well-accepted criterions of wireless system performances. These effects will be observed in the function of instantaneous and average signal-to-interference ratios (SIRs). SIR-based performance analysis is a very effective performance criterion since SIR can be measured in real time both in base and mobile stations. An interference-limited system will be discussed, so the effect of noise would be ignored. with Ω d =E[ R α ], denoting the desired signal average power, while I n (.) is the n-th order modified Bessel function of the first kind (, Eq. (8.406)). As mentioned, parameter μ d defines the number of multipath clusters, through which desired signal propagates, while parameter η d defines the ratio of the in-phase and the in-quadrature component variances in desired signal . Desired signal propagation environment non-linearity is defined with parameter α.
with Ω c =E[ r α ], denoting the CCI signal average power. Parameters α, η c and μ c are describing CCI signal propagation in the same manner as parameters α, η d and μ d are describing propagation of desired signal. f λ ( λ ) = 1 2 λ ∫ 0 ∞ f R r λ f r ( r ) dr.
with Γ(.) denoting the well-known Gamma function (, Eq. (8.310/1)), while (x)! stands for the factorial operator. The double infinity sum in (4) converge rapidly, as one can see from Table 1, since only few terms should be summed in each sum in order to achieve accuracy at the 6th significant digit for various values of corresponding system parameters. The PDF of instantaneous SIR for various values of system parameters is presented in Figure 1. This is done to achieve accuracy at the 6th significant digit. PDF of instantaneous SIR for various values of system parameters. with B(a,b,z) denoting the well-known incomplete Beta function (, Eq. (8.391)). Rapid convergence of this double infinity-series could be seen from Table 2.
where corresponding CDF’s for the uncorrelated input branches are defined with (5). 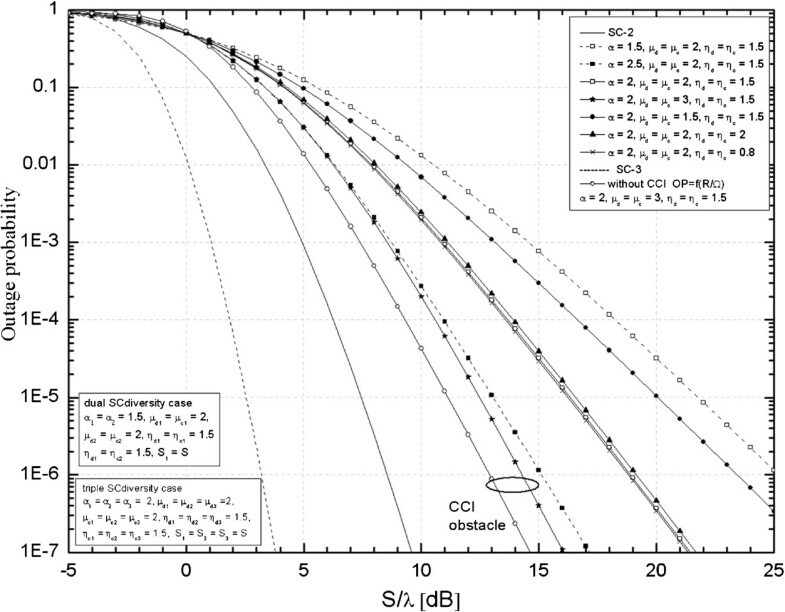 It is visible from Figure 2 how CCI as a major obstacle affects transmission in observed propagation environment. Another conclusion from Figure 2 is that lower OP values are achieved, in the areas where η, α and μ parameters obtain higher values. OP for various values of wireless communication parameters in the interference-limited system. Further, performance improvement obtained by the appliance of selection combining (SC) reception technique was presented at this figure. Improvement obtained with the usage of dual-branch SC diversity is visible, since for the same system parameter values, significantly lower OP values are reached. Based on (4) and (5), other well-known performance criteria, such as, i.e. ABER, and output moments could be efficiently evaluated and graphically presented for this scenario. In order to superimpose the influence of multipath fading, modelled by general α−η−μ distribution, with shadowing process modelled with Gamma distribution, for the first time in the literature, we will present in this section novel composite fading distribution. As multipath fading and shadowing simultaneously occur in wireless transmission, there is a need to derive general model which would accurately describe this composite random process. with K v (.) denoting the modified Bessel function of second kind and order v (, Eq. (8.407.1)). The convergence of expression (10) is rapid, since few terms should be summed for achieving the 5th significant digit accuracy for various values of corresponding PDF parameters. Newly derived composite PDF is presented in Figure 3 for various values of corresponding parameters. PDF of novel composite distribution for various values of corresponding parameters. where G m , n p , q ( b ) q ( a ) p ∣ x stands for Meijer’s G-function (, Eq. (9.301)). Rapid convergence of this expression could be seen from Table 2.
m n = ∫ 0 ∞ R n f R ( R ) dR = ∑ j = 0 ∞ ( η − 1 ) 2 j η μ + n / α π Ω 0 n / α Γ ( c + n / α ) Γ ( 2 μ + 2 j + n / α ) 2 2 j − n / α − 1 μ n / α ( η + 1 ) 2 μ + 2 j + 2 n / α Γ ( μ ) Γ ( c ) Γ ( μ + j + 1 / 2 ) j ! . where P e (t) denotes conditional error probability, whose functional dependency is determined by the type of modulation scheme performed. For some non-coherent modulation schemes, it stands P e ( t ) = 1 2 exp ( − gt ) , with g denoting modulation constant, (g=1 for BDPSK and g=1/2 for NCFSK), while for some coherent modulation schemes, it stands P e ( t ) = 1 2 erfc ( gt ) with g denoting modulation constant (g=1 for CPSK and g=1/2 for CFSK) and erfc (x) being complementary error function (, Eq. (8.250.4)). where r denotes random envelope process, γth stands for the average received signal-to-noise ratio (SNR) and B stands for the bandwidth of a channel. 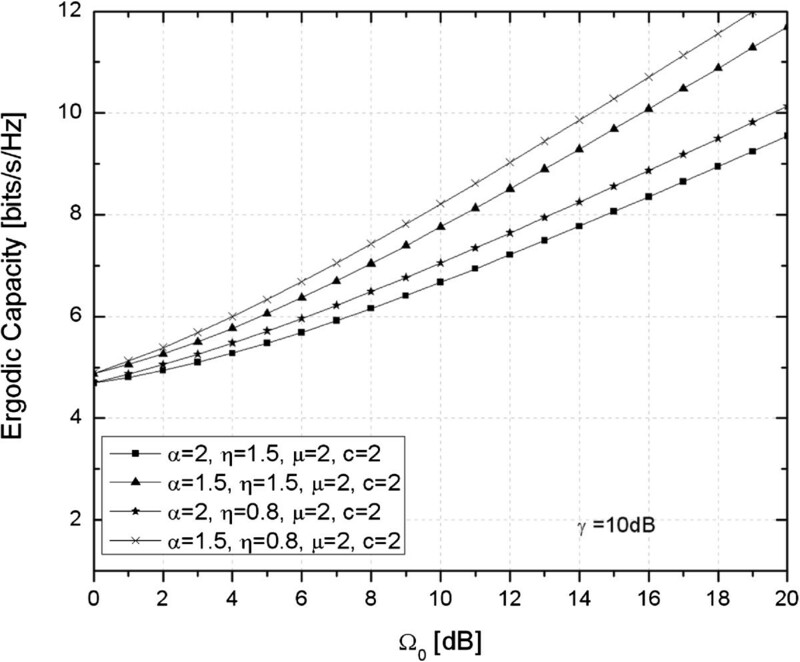 Ergodic capacity of observed communication channel as a function of composite process parameters are presented in Figure 4. It is visible from Figure 4 that when fading is less severe (parameter α obtains higher values) and when the ratio of in-phase and in-quadrature propagation components is more balanced, higher normalized capacity values are reachable. Ergodic capacity in the function of observed composite process parameters. In Figure 5, some results are graphically presented in the function of corresponding parameters. It can be seen from Figure 5 that better performances (lower ABER) values are achieved, where parameters c and α have higher values. Also as expected, better performances are obtained, for higher values of η, α and μ parameters. Namely, for higher α parameter values, fading is less severe, while a number of multipath propagation components of same phase delay grows with μ parameter growth. Also, c parameter growth leads to OP decrease; since then, shadowing is more severe.Additionally, in Figure 6, a graphical comparison of ABER performances obtained when transmission is observed over non-coherent (NCFSK, BDPSK) and coherent (CFSK and CPSK) modulation schemes for the same set of system parameters is shown. 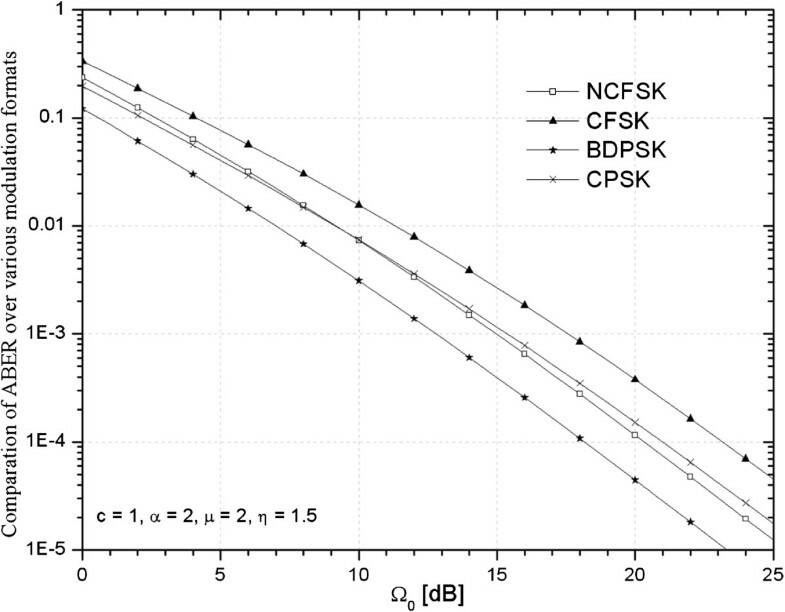 A comparison of curves shows better performance of non-coherent modulation formats, while the BDPSK modulation scheme usage is depicted as an outperforming option. ABER over NCFSK modulation scheme for various values of wireless communication parameters in the composite fading/shadowing environment. Comparison of ABER over various modulation formats. This paper has considered wireless communication in a general fading environment, which can be reduced to other types of fading environments like Rayleigh, η−μ, Nakagami-q (Hoyt), Nakagami-m, Weibull. Obtained closed-form expressions for PDF and CDF of SIR for the interference-limited system case and closed-form expressions for first-order statistics (PDF, CDF, moments of various order) of newly introduced composite fading/shadowing model allow simple unconstrained analysis and accurate wireless system planning and performance evaluation. Some of the performance measures are evaluated and discussed in the paper. Goran Stamenović, Stefan R Panić, Dejan Rančić, Časlav Stefanović and Mihajlo Stefanović contributed equally to this work.